Blue Planet Energy Systems Ltd. designs and develops holistic waste management and stable energy production systems. We extend the ecological value stream, turning municipal waste into a resource, rather than a costly liability. There's nothing on earth like us! Blue Planet Energy Systems Ltd has created a unique solution to derive maximum value from existing ecological resources. Our energy recovery systems deliver efficient, stable power generation and (where needed) water desalination whilst simultaneously dealing with the acute landfill problem prevalent in every city around the globe. 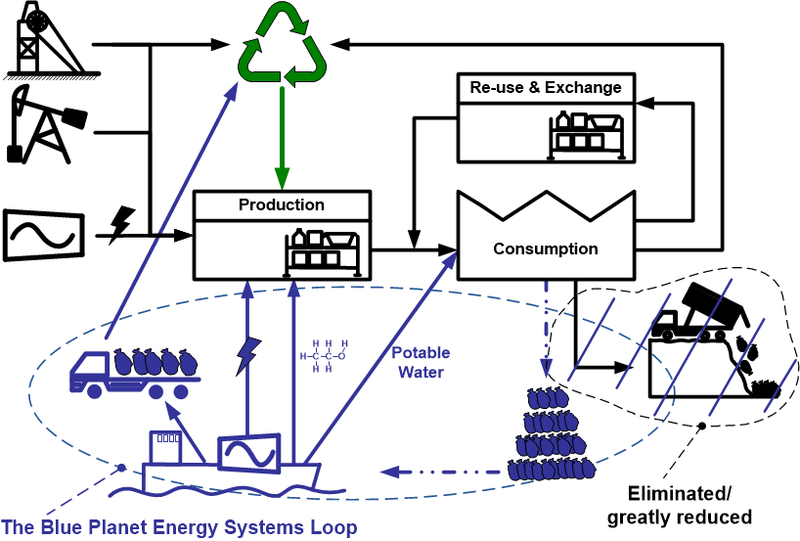 The "Blue Planet Energy Loop" turbo-charges the ecological value stream. Our unique modular, flexible design allows us to deliver power generation and waste management systems in the context of our client's environment. Client needs are at the heart of our solutions, in stark contrast to the take-it-or-leave-it approach of large-scale, high-cost OEMs. No other power generation system offers the financial and societal benefits of the Blue Planet Energy value stream. We deliver sympathetic power and waste management systems.